Women's slogan jumper from Levi's. 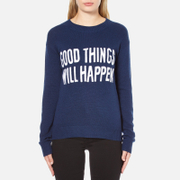 Cut from a soft wool blend with a regular fit, the sweatshirt features a ribbed crew neck and contrast slogan to the chest: 'Good Things Will Happen'. Complete with long sleeves and ribbed cuffs and hem. 38% Viscose, 35% Nylon, 22% Wool, 5% Alpaca Wool. Model is 175cm/5'9 and wears a size S.